After a big event, some people re-evaluate their lives and get a really big computer monitor. Views like, how long should I grow my hair? Maybe I should just let it grow out for a change. We're lucky that the sinking of the largest cruise ship in history, killing dozens of passengers, has created strong buzz. This will really sell a lot of advertising. Including ads for blue hair dye. A week ago today, I stood in Martin Luther King Jr's childhood home, where he was born, in Atlanta, Georgia. Yesterday, I stood on the steps of the Lincoln Memorial in Washington, D.C.
Dr. King and his message of peace and freedom have been on my mind a great deal over the past seven days. Forty-nine years ago today, Dr. King gave his famous "I Have a Dream" speech on the steps of the Lincoln Memorial. I invite you to spend 20 minutes and listen to his speech in its entirety. I found this a wonderful way to ponder the importance of human dignity, equality, and God's love for all of His children. We will return to Mary Worth and her comedy high-jinx tomorrow. I took my daughter to Atlanta, Georgia, last week. We had an incredible time together and discovered that Atlanta is a really fun city to visit. We went to the Georgia Aquarium and Stone Mountain and the Martin Luther King Historical Site. But the weirdest thing in Atlanta is The World of Coca-Cola. Located in the heart of downtown, the World of Coca-Cola is nothing less than bizarre. The closest analogy I can make to describing this experience is being indoctrinated into a strange, fizzy, corn syrupy cult. We paid our $16 each, and entered the welcome chamber. The 20 foot high walls were covered top to bottom with Coca-Cola advertising from across the ages and around the world. 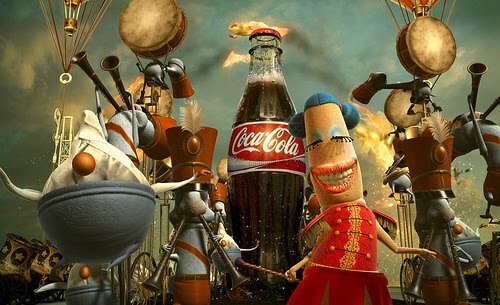 There, a Coca-Cola priestess introduced us to some of the sect's primary principals: Peace, Love, and above all, Happiness. We were told we would now watch a 7 minute orientation film. In the film, strange non-human characters taught us to "try new things" and "be in the now." 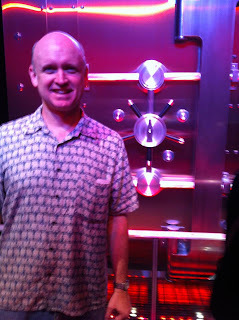 After we watched the film, we were invited to view the inner-sanctum, also known as the Vault, wherein is kept the Holy writ containing the sacred recipe. We waited with the other converts, surrounded with displays explaining the need for secrecy. Our photos taken, our bodies digitally scanned, we were now permitted to enter the Holy Place. A 360 degree film depicted the inside of a cola glass filling with ice and soda, as we stood in the middle of it, and listened to Donald Sutherland recite the holy rites officially baptizing us. 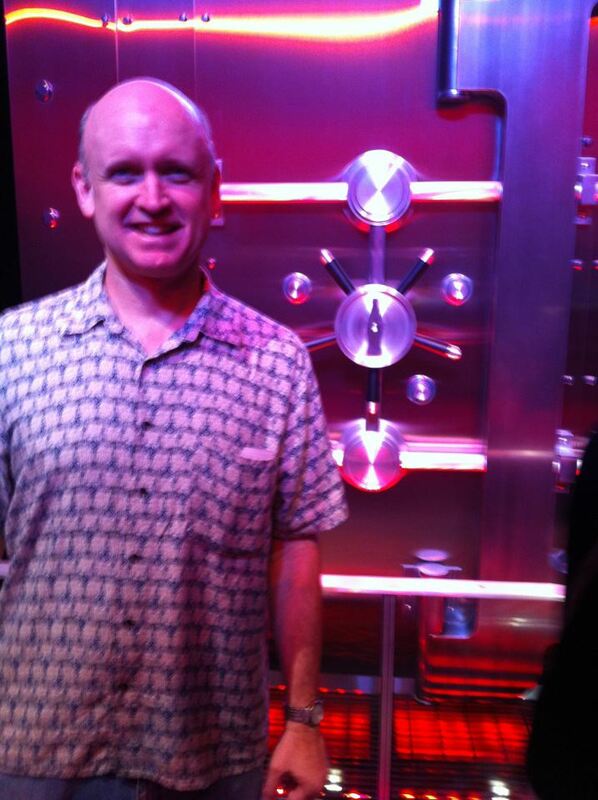 Then the screens parted and we were allowed to view the Vault, the Holy of Holies if you will. But we were not permitted to enter, of course, for only the High Priest may do so. 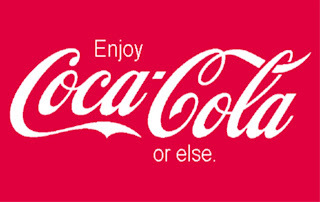 The message we were to embrace was, and I quote: "Above all, Coca-Cola evokes a passion for living." Then we were taken to the tasting room. Like every top-level cult, we needed to sip the punch. And there were 60 to choose from, from every corner of the world. We were given a bottle of cola to take home with us, and then asked to leave through the gift store where many new initiates and novices were paying their own money to purchase shirts and caps emblazoned with the Coca-Cola logo to assist in their own proselytizing efforts. Interesting side note: Coca-Cola gets its name in part from its use of the coca leaf, which gave it quite a cocaine infused kick. Pepsi got its name from its use of pepsin to aid in digestion. 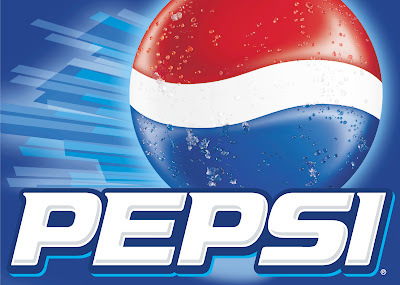 I'm more of a pepsin kind of guy. With a plot twist like this, I'm in a prime position to pull in NEW NUMBERS of followers of this blog! Following this blog is FREE and FUN! So come on all you NEW NUMBERS! Follow this Blog by clicking here! "Weston, your next assignment is to plagiarize a story about your experience on board that sinking ship. But here's the twist: I want you to write it as a comic strip! We've struck gold, Weston! Gold!" I didn't feel my world was ending until AFTER this strip. Tell me again, and again, and again, and again... and again, for I am a ghostly specter condemned to wander the halls of Charterstone, sipping Sanka and suffering the pain of endless redundancy. "People are great. I love when people help people. Because people need people. They're the luckiest people. Also, could I please have a napkin to wipe the water off my father's chest?" If not for the excellent May 2012 Vanity Fair article by Bryan Burrough on the tragic and shameful sinking of the Costa Concordia, Karen Moy wouldn't be sitting here telling us this story! Life is brutal, at best. Speaking of ugly scenes, this evening's dinner blobs have transformed Mary into something from a Tim Burton movie. Something from a sad Tim Burton movie. But we did! And that's all that matters! Wilbur's been eating a lot of ham sandwiches to deal with his survivor's guilt. And, clearly, it's been working. It's good to see the Unita del Mare being raised back to its upright position. Yesterday it was lying on its side half submerged. If not for the coming together of porpoises and a team of hyper-intelligent flounders, the ship would still be under water. 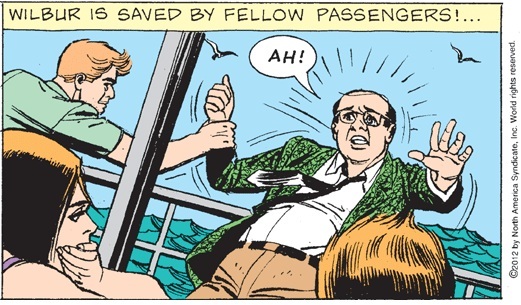 This is the first moment when the Mary Worth version of the sinking of the Costa Concordia diverges from the Vanity Fair article from which it was heavily inspired. The second to last paragraph reads, "Few believed they would see justice for those who died aboard the Concordia, at least not anytime soon. 'At the end of all this,' one man predicted, 'it will all be for nothing. You wait and see'" (Vanity Fair, May 2012). Life is always less brutal in the Worthiverse. This is wonderful news! I guess it was all worth it in the end. Worth every penny! Who ever would have guessed that something as inconvenient as a major maritime disaster would have had such a delightful outcome. A few bumps and bruises, and a cholesterol level of 252. The characters of Mary Worth continue to struggle with the believability of this story. The characters are more like real people than I realized. Speaking of interesting columns, George R.R. Martin, the author of Game of Thrones, has expressed his concern about those U.S. states that are requiring voters to show identification papers. He's got some real concerns about this issue, and after reading his article, I can only say, "Life is brutal." Poor Dawn indeed. The last thing she needed after Dave dumped her was a shipwreck. That's what I call bad timing. Another fun Costa Concordia fact: "Local schools and the church were opened, and the first survivors were hustled inside and given blankets. Every free space began to fill" (Vanity Fair, May 2012). Even though they've reached land, and got their blankets, and Dawn's life has been changed, their fate still seems inextricably linked to the whims of Bryan Burrough at Vanity Fair and his editors. When I was in the sixth grade, I had to write a series of Reports on various civilizations in the ancient world: Egypt, Greece, Rome, and the Middle Ages. My research was very thorough: I would look up the subject in my parents' World Book Encyclopedia set, and copy the article, but change the words as best I could to make it sound original. This Costa Concordia story brought back a lot of warm childhood memories for me. 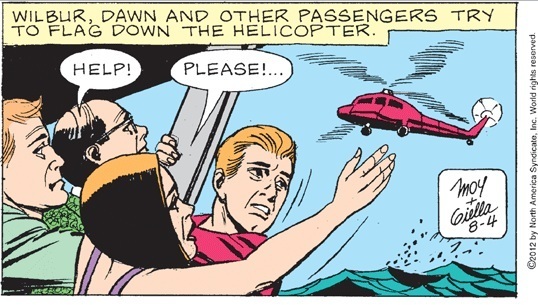 It's a good thing Wilbur and Dawn caught that helicopter. None of the lifeboats seem to have made it off the ship. Ha Ha Ha Ha! It's funny because it's an ironic reference to the sinking of the RMS Titanic which happened in 1912, a century ago. Except that it's NOT funny because this story was a trivial recreation of the sinking of the Costa Concordia which happened in 2012, this year. Just in case anyone was wondering what the email address for King Features' public affairs is, it's kfs-public-relations@hearst.com. You know, just in case you wanted to let them know how awesome you think Mary Worth is. Because it is. It's the funniest strip in the newspaper. Let's not lose sight of that. Dawn's familiarity with anatomy is as confused as Mr. Giella's. Neither can I! Gee, I guess life isn't so brutal after all, is it Dawn. Unless you're one of the families still mourning the loss of 32 victims on the Costa Concordia less than seven months ago. For them, life is brutal and this adaptation (blatant rip off?) from the excellent Vanity Fair article has been more than a little insulting. 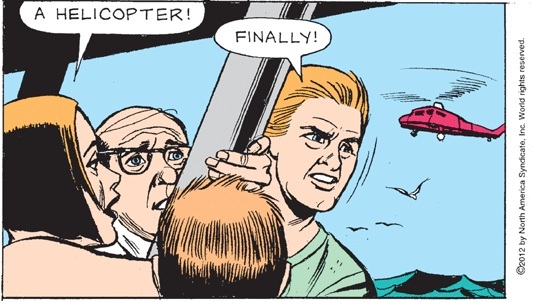 Captain Thunderbird seems more than a bit concerned about the drag Wilbur is having on the rescue copter. Then again, Wilbur is always a drag. Just ask Dawn. I'm not sure which looks more precarious, the Unità del Mare or the Barbie Helicopter when it comes time to set down on those struts. "Save us! Not the other 4,000 passengers!" Save the really strong swimmer and the two rugged males in the prime of their lives. And the fat middle aged guy, too, if there's still room. Pilot: "Attention passengers! We are here to rescue you! We only have two extra seats so the two most enthusiastic passengers will be rescued first. Come on, passengers! Let's hear it! Who wants to be saaaaAAAAaaaved???!!!!" "Quick. Get on the helicopter before the other 4,000 passengers notice!" Another fun Costa Concordia fact: "Both helicopters were, figuratively and literally, operating in the dark. There was no chance of communication with anyone on board; the only way to assess the situation, in fact, was to lower a man onto the Concordia" (Vanity Fair, May 2012). "We have to get off this ship! Quick, everyone jump overboard!" Woah! Who is that handsome stranger? Finally, love arrives. I was wondering when that was going to happen. And fortunately, Dawn caught her face just as it was falling off. Hopefully, she can get it back into place before Mister Handsome notices.